Best-Interview-Strategies.com is dedicated to helping you find the resources you need to choose the right path for your personal situation (your career). However, the information provided herein is NOT legal or financial advice. It is for informational purposes only. 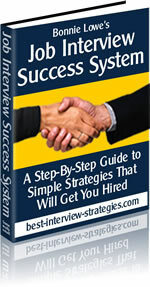 Best-Interview-Strategies.com is not meant to replace the guidance of a competent legal or financial advisor. Best-Interview-Strategies.com cannot assume any responsibility for decisions to utilize any hyper-link found on this site. Information on each product reviewed and discussed herein is accurate, as far as we know. Although we strive to deliver current, factual, correct information, we cannot be held responsible for the accuracy or usefulness of any materials contained on any site linked to from Best-Interview-Strategies.com. We are not liable for any losses or damages which may occur through your use of any information or product(s) which you obtain via this website or any affiliated websites. We do not guarantee, implied or otherwise, that the links and information provided for each product are current and/or correct. You assume all risks in utilizing any links from this site, including those found in product reviews, advertisements, or other third party links.